I figured I would read a few pages of We Are Okay before going to bed – but I never made it to bed. I ended up staying up until the book was finished. 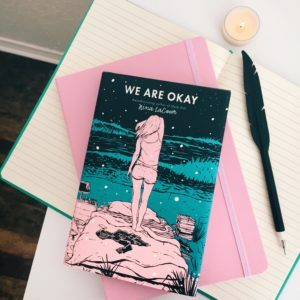 It helped that it’s a short, fast, read to begin with, but We Are Okay was also an emotional and heartbreaking read that compelled me to keep reading. There was no earth shattering plot, but the emotions this story evoked were so powerful that it’s worth a read. 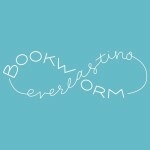 There was so much sadness and loneliness surrounding Marin that I felt it pour off the pages. Nina LaCour did an amazing job using Marin’s surroundings to show that sadness and loneliness. With the empty dorm, the New York storm, and the tension between her and Mabel it felt like I was experiencing her emotions. The back and forth of Marin’s past and present made this story all the more real. I haven’t read such a realistic story in a long time. I really think this story could be relatable to many readers. We Are Okay deals with loneliness, grief, love, friendship, and even forgiveness and hope. They’re feelings we have all felt at one point in our lives and I think many could feel for Marin and even the desperation of Mabel to understand Marin. With realistic relationships, feelings, and refreshing POC, bi, and lesbian characters I highly recommend We Are Okay. Great review! I really want to pick it up now! Excellent review! I love your wording about the emotions pouring off the pages. I’m so looking forward to this book because it will be one that stays with me long after I’m finished. It really will be. You’ll love it. I love when a book is really just about emotions, and not plot twists and surprises. Can’t wait to read this one. This book will really make you experience a wide range of emotions.